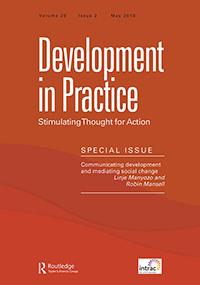 The Development in Practice special issue for this year, ‘Communicating development and mediating social change’ (Volume 28, Number 3, May 2018) responds to the need for a radical rethinking of the theory, practice, and teaching of communication for development. The issue emphasises the need for alternative ways of communicating and practising development interventions. One article, ‘Instrumentalising the digital: adolescents’ engagement with ICTs in low- and middle-income countries’ is open access, and freely available to read and download. Among the 11 articles are those that critique the discourses and practices of communicating about development interventions within communities mainly in the Global South, and the discourses and practices of formal policy-making and development interventions. Case studies drawn are from Brazil, northern Canada, Ghana, India, Papua New Guinea, the Philippines, and sub-Saharan Africa. Also included are papers that provide a critical reflection on asymmetries of power that infuse development interventions in the Global South at a more structural level. If you are interested in submitting articles to Development in Practice, visit http://www.tandfonline.com/toc/cdip20/current to find out more.